Grilling season is in full swing and here at my house, we just can’t get enough. There’s nothing we look forward to more than the weekend, so that we can all gather on our patio, enjoy an al fresco meal, and linger long into the night listening to music, catching fireflies, and toasting marshmallows over an open fire. For the long weekend ahead, I just love to take advantage of the natural beauty of fresh berries. They’re so pretty and colorful, and they make everything they grace look patriotic. This red, white, and blue flatbread makes a great snack or dessert for your celebratory cookout. It all begins with the dough. 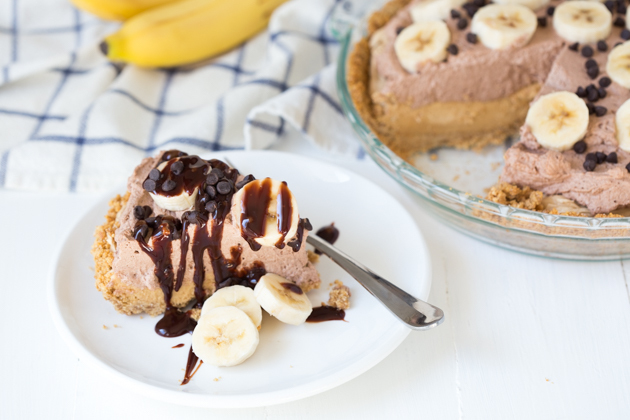 I love this recipe because it comes together so quickly, with no long rise times required. Just place the flour, instant yeast, and salt in the bowl of your KitchenAid® Stand Mixer fitted with the flat beater, and stir together on a low speed of 2. 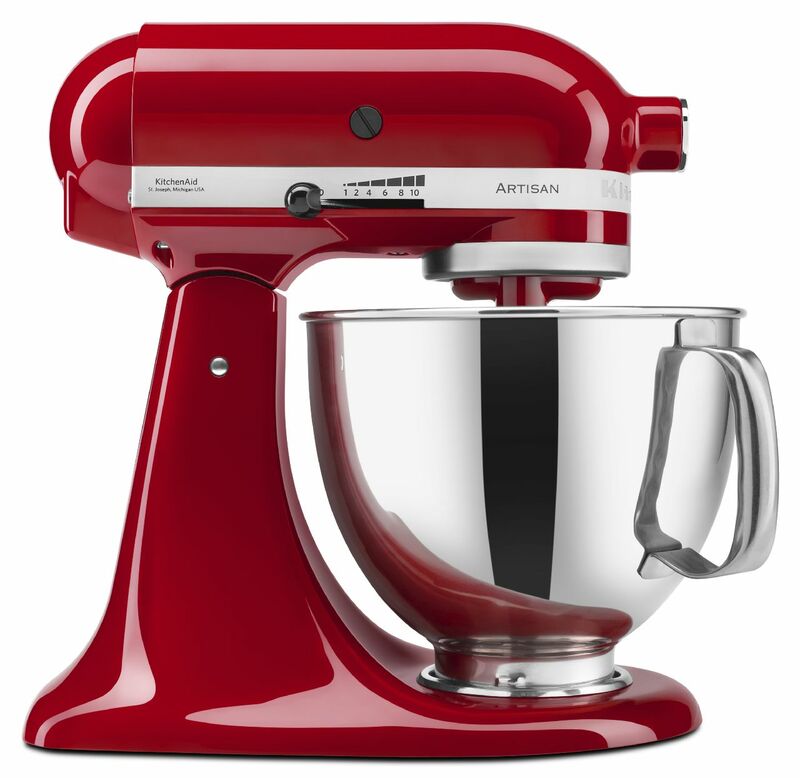 This Stand Mixer is so powerful, and because it’s hands-free, your life is so much simpler. In a separate bowl, stir together the warm water, honey, and oil. Then, pour the liquid ingredients into the dry ingredients in your Stand Mixer, and mix together on a medium-low speed of 4 or 6 until incorporated. Once everything is well combined, switch out the flat beater with the dough hook on your Stand Mixer and gradually add the whole wheat flour. You may not need all the flour- add just enough so that the dough pulls together into a ball and no longer sticks to the sides of the bowl. Knead the dough for about 5 minutes, or until it feels smooth and elastic. Allow it to rest for 10 minutes before preparing it to grill. 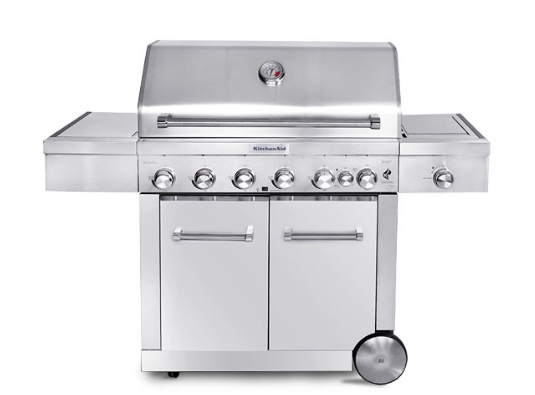 The KitchenAid® Stainless Steel 8 Burner Gas Grill is a great way to extend your kitchen to the outdoors. We just love the sleek look and EvenHeat™ Technology. 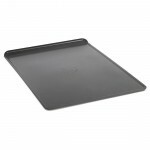 Plus, the slide-out tank tray makes this Gas Grill so simple to use. I like to heat the grill to between 500°F and 600°F. Once you open the lid, you’ll lose a bit of heat, but by preheating to a high temperature, you’ll ensure that those grates are good and hot, which will add a nice smoky flavor and some beautiful grill marks on the crust. Now that the dough has had a little rest, just flatten/stretch it out to a rough circle shape, about 1/4″ thick. It’s nice to do this on a peel if you have one, but I’ve found that my KitchenAid® Cookie Sheet works just as well. Three of the sides have no lip, so just sprinkle the Cookie Sheet with an even layer of semolina and it slips onto the Gas Grill like a dream. Grill the dough for about 3 to 5 minutes, or until it’s got some nice marks on the underside, and it’s “set” enough to flip over with tongs or a big spatula. Flip the dough over and cook the other side for an additional 2 to 3 minutes. Top the warm grilled flatbread with a sweet and creamy whole-milk ricotta, infused with vanilla and lemon and whipped to fluffy perfection. To make it, simply place the cream cheese, sugar, vanilla, lemon zest, and salt in the bowl of the Stand Mixer, fitted with the whisk and whip together on a medium-high speed of 6 until smooth. 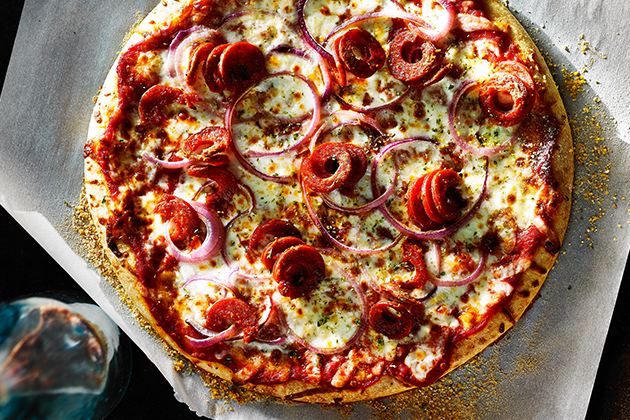 To assemble this gorgeous sweet pizza, slather the ricotta mixture over top the warm honey whole wheat crust. Nestle fresh strawberries, blueberries, and raspberries into that cloud of sweet ricotta, and dust with powdered sugar for a gorgeous presentation that’s just perfect for a patriotic celebration! 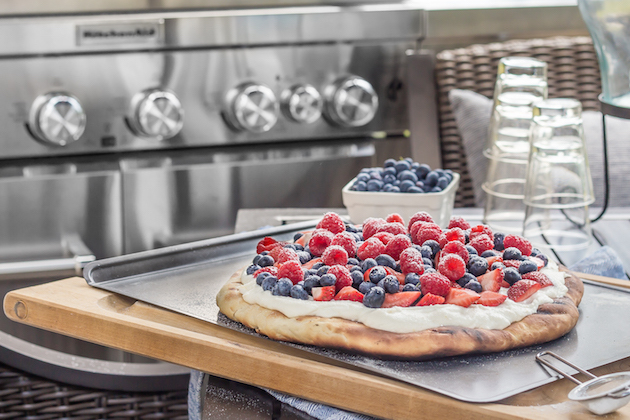 Be sure to share your take on this Honey Wheat Grilled Flatbread with Fresh Berries and Whipped Ricotta recipe with us on Instagram using #MadeWithKitchenAid for a chance to be featured. Place the all-purpose flour, yeast, and salt in the bowl of the KitchenAid® Stand Mixer, fitted with the flat beater, and stir together on low speed (2). In a separate bowl, combine the water, oil, and honey. Pour the liquid ingredients into the bowl of the Stand Mixer, and stir together with the dry ingredients on medium-low speed (4 or 6) until combined. Switch out the flat beater with the dough hook. While stirring on medium-low speed, gradually add the whole wheat flour, just until the dough pulls together into a ball and no longer sticks to the sides of the bowl. You may not need all of the flour. Knead the dough in the Stand Mixer for 3 to 5 minutes, or until it feels smooth and elastic. Allow the dough to rest for 10 minutes. Preheat the KitchenAid® Stainless Steel 8 Burner Gas Grill to 550°F. Flatten/stretch the rested dough to a thickness of about 1/4″. 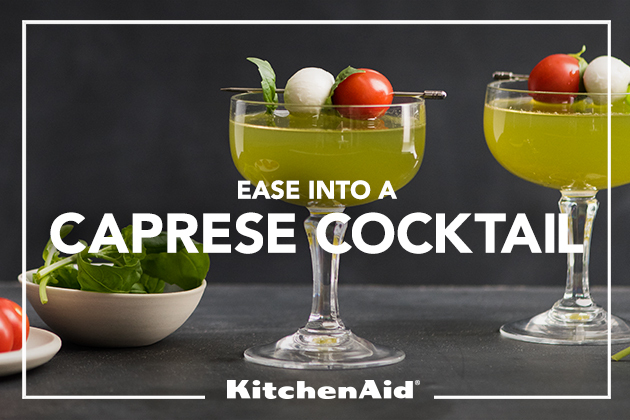 Transfer it to a KitchenAid® Cookie Sheet, dusted with semolina. Slide the dough onto the grates of the hot Gas Grill, and cook for 3 to 5 minutes on medium heat, or until browned on the bottom. Flip the dough over and cook the other side for an additional 2 to 3 minutes. Place the cream cheese, sugar, vanilla, lemon zest, and salt in the bowl of the Stand Mixer, fitted with the whisk and whip together on medium-high speed (6) until smooth. Add the ricotta and cream, and whip until fluffy. Spread the cheese mixture over the warm flatbread, top with fresh berries, and dust with powdered sugar.